In March 2013, I revealed that Miftah, a Palestinian NGO, founded and headed by Hanan Ashrawi had published an Arabic article that said that Jews use the blood of Christian children for Passover matzah. After the issue was publicized Miftah took it down and eventually apologized in English after defending it and attacking me for publicizing it. Of course, the blood libel is not the only problem at Miftah. I documented that they supported terror attacks and they are explicitly against peaceful coexistence with Israel. 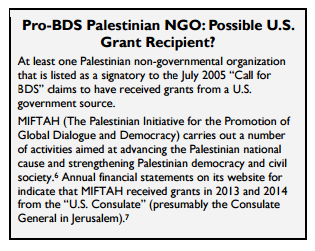 Miftah is also one of the signers of the original 2005 Call for BDS. At the time, Miftah enjoyed monetary support from Oxfam, NED, Norway, Austria, the Anna Lindh Foundation and others. But since I exposed their hate and lies, they have gained another funder. The very year that Miftah was in the newspapers for pushing the blood libel is when the US decided to give them $175,000, paying that sum over two years. US taxpayers are funding a hate organization. Previous story Did Israel help create Hamas? Jim Clancy thinks so!